I bought this euphorbia from my local nursery in a plant sale. I wanted to increase my collection of euphorbias, as I liked how easily they seemed to grow here. I'm sorry that I don't remember what it was called - it's possibly Euphorbia Martinii. 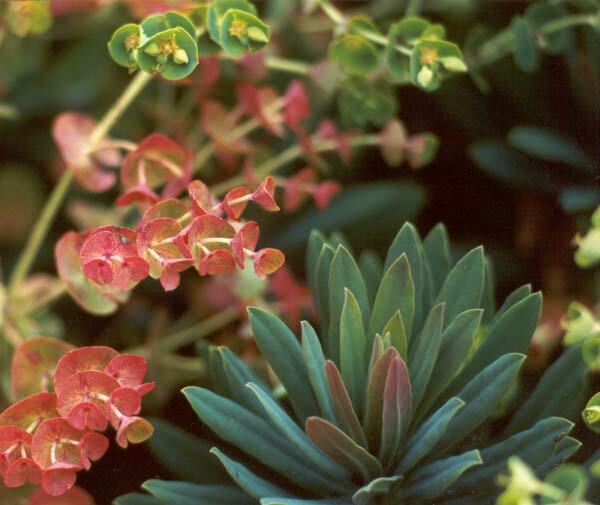 I have several of these bushes in quite different locations in the garden - some sunny, some shady - and as long as I remember to trim off the older seed-heads this Euphorbia always looks great. Eupohorbias have beautiful subtle colour shades, and are a garden photographer's dream on spring mornings as dew droplets collect on their leaves. I also grow the yellow variety which seeds prolifically. It is a bit of a nuisance, but looks absolutely gorgeous in spring. Forgiven!